The other week, I mentioned that I use leftover fast food paper napkins to help drain fried foods. Well, the other day, I remembered one other good use (for either paper napkins or towels). 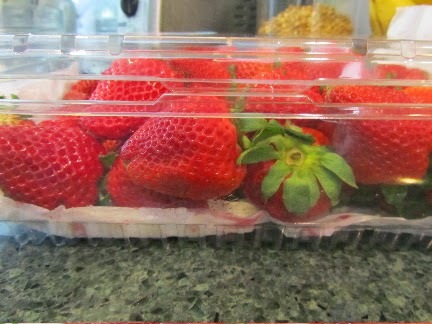 To place at the bottom of a grocery store plastic clamshell, full of berries. 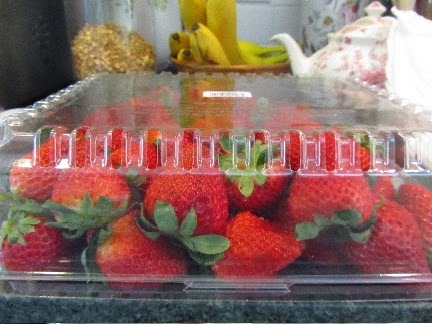 If strawberries are left in the plastic clamshell for more than a few days, the moisture from the bottom layer of berries has no place to escape to, and I find I'm inclined to discover moldy berries after just a handful of days. However, if I place a paper napkin under the berries, inside the clamshell, my berries keep fresh and in good condition for up to a week (if they don't get eaten). And I get a few uses out of these paper napkins. Because they don't become truly soggy with this use, I just fold them loosely and put in the cupboard above the counter. I use them a few times over the course of the season, and they end their useful life, either to drain fried foods, or to wipe out a greasy pan. The trick is to get the paper towel/napkin under the berries, without unloading the entire clamshell. Here's how I do it. After I pull out a few berries for that first meal or snack, I reseal the clamshell shut. I carefully turn the clamshell over and rest on the counter. 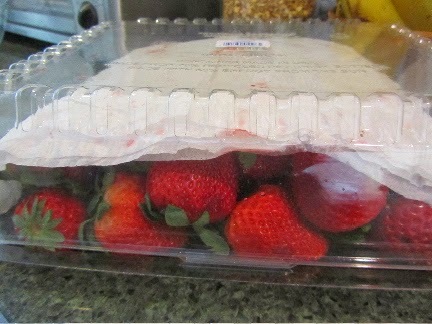 Then I carefully open the upturned container and lay a couple of unfolded paper napkins over the berries, inside. I reseal the container, and once again turn the clamshell over, very carefully. That's it. The paper napkins are now on the bottom of the container, under the berries. For other fresh produce, I prefer to use my salad spinner for storage, or wrap items in a non-linty tea towel. 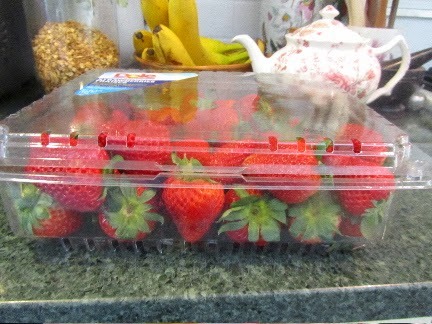 I'm reluctant to use a tea towel for storing berries, due to potential staining. But I've been thinking to try some unbleached muslin fabric squares at the bottom of berry containers. I'll let you know how that works when I try it. In my mind, using paper towels/napkins isn't an all or nothing proposition. I am satisfied to use them very, very sparingly, while still finding alternatives wherever I can. I just think that's a sensible approach. We have done that before with paper towels. I find that I try to reduce usage of things like paper towels, but I don't really see myself ever completely getting rid of them. I admire people who make a concerted effort to eliminate paper and plastic waste completely from their lives, but I think I would make myself crazy if I did that. I guess I have a similar philosophy in many areas of my life ... most of my diet is healthy but sometimes I splurge ... we recycle/compost but I will never claim to be perfect in this area ... overall our budget is modest but sometimes I indulge in spur-of-the-moment purchases. I agree, Kris. For me, everything in moderation works best. I just try to be sensible about things like this. I think that I come across as extreme to some people. But I'm really not. I've probably tended to highlight some of the more extreme things that I've done, because we all already do many of the less-extreme things. it's amazing, isn't it, how something so simple as your grandmother using a paper towel for a batch of washed lettuce could extend its usable life considerably. And by washing it all at once, it's a real time-saver, too! Strawberries seem to be the worst for molding, so it's worth it for me to use a paper towel for this use. They are the worst, aren't they? And once one goes slimy, the rest of the container isn't far behind. If you want to keep your berries for a long as 2 weeks without spoiling, swish them in a 5-1 water vinegar solution rinse thoroughly air dry and put in bowl in refrigerator. The vinegar bath will destroy the bacteria that produces mold. You will not be able to smell or taste the vinegar..in fact I do this to all my fresh fruits and vegetables when I bring them home. You would be amazed at how much dirt you have in the bottom of hitchhiker and at how long your fruits and vegetables last. Does this work for bagged spinach? I'm pretty good at using produce in a timely manner but spinach gets the best of me. I've read this tip on the internet several times, but never tried it myself. I'm glad it works for you. One thing the produce guy at our market told me was to ask them, when the berry shipment came in, and only buy berries that they've received within the last 24 hours. 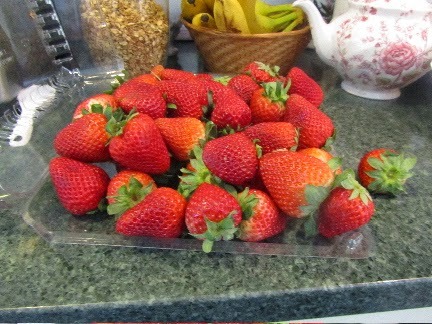 He also said that temperature is key with strawberries. Keep them cool. Use a picnic cooler in the trunk, to get them home, if it's warm out. Kris, from what I understand, the enemy of fresh spinach is excess moisture. Lining a plastic container with paper towels, then dumping the bag of spinach in it, will extend the life of your fresh spinach by a few days. Doing this also gives you an opportunity to see and remove any leaves about to go slimy. And if you're sure you won't finish a whole bag of spinach, you can freeze part of it in baggies right away, to use in green smoothies or cooking, later.